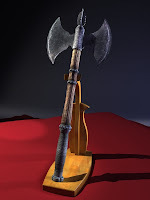 So here is the promised Battle Axe, which we modeled in a basic modeling class at the Games Academy. It was the course GD_II_08. The students were quite fast in understanding 3dsmax. As always Textures are not perfect.